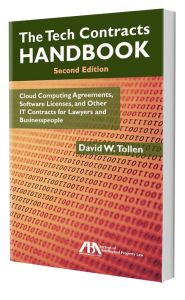 Writing and negotiating software and cloud computing contracts can be slow, risky, and intimidating, and few professionals receive effective formal training. The result? A learn-as-you-go approach that leads to delayed contracts and puts your company at risk – and leaves contract drafters uncomfortable with their own skills. Tech Contracts Academy™ was created to bring confidence and expertise to your deals and to you. Your Portal on Information Technology Contracts, Forms, Articles, Training, and More.